Good Smile Company is going to release the Nendoroid No. 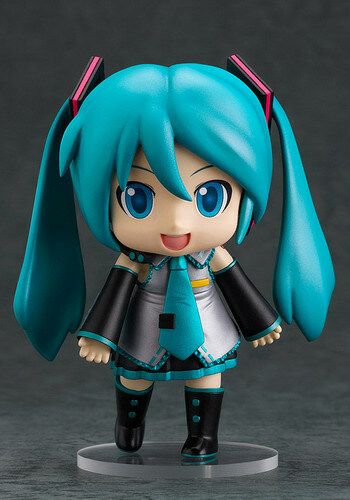 274 Mikudayo- ( ミクダヨー ) action figure from the popular singing synthesizer application “Vocaloid 2″. Will be released in March 2012. Around 100mm tall, 2,858 yen. It’s funny how people react to this Mikudayo! 🙂 Many called it ‘fat’ and think it’s weird. Well, it is actually the name of the human-sized character suit of Hatsune Miku modeled after the first Nendoroid Miku. Get the logic? So basically after the first Nendoroid Miku was released, a human-sized suit was made to resemble it. Then another Nendoroid Miku was made after the human-sized version, called Mikudayo 🙂 Yup, that’s Miku logic for you (^o^) So what do you think? Interesting?